Assuming the 401/402 can lift the CST-100 to LEO, how much delta-V/altitude increase would be provided by SRBs, in either 1/2/3/4/5 configuration? Are you suggesting that CST-100 is built with a single destination in mind? Bigelow Destiny I and II are in a ~100km higher orbit than ISS, and different inclination. I would be surprised if Boeing limited the capsule's capabilities so much. Jim is focused on trips to ISS (what's built). You could be right about the higher orbits getting confusing materials out. The ISS is a max inclination for manned station for the foreseeable future. Because there is no need for higher inclinations while it would make it more expensive to reach from lower latitudes, or is there a more fundamental reason? Of course, those solid boosters must light after the RD-180, so there is already confidence in the liquid portion of the first stage. The RD-180 can be shut down if a SRB failure is detected. Of course, a SRB failure might also take out the Atlas core tank, even with the RD-180 shut down. Either way, the thrust required to get away from an exploding core must be greater than what those Aerojet SRBs can generate. We're not talking Shuttle SRBs here. These things are relatively small. If the CST-100 can get away from a core failure, it should be able to get away from an SRB failure. Take in consideration that the SRB supplies about 172tonnes of force. An Atlas V weights 330tonnes + payload (let's say 340tonnes?) of which 284 are RP-1/LOX. And the SRB fire for 116s, while the core does for 242s. So, at SRB cut off we can assume that at least 40% of propellant is remaining in the core. So, even in the worst case, the T/W with a single SRB would be 0.77 in the worst case. The only problem would be asymmetric thrust issue. But if that happens after you've cleared enough to avoid recontact issues, it would actually help to get the core out of the capsule's way faster. Is there a technical reason for that? Are the 4xx cores less structurally strong than the 5xx cores or something? I had just assumed that the cores were all the same and ULA just did not bother to offer more than 3SRBs on 4xx cores because they did not anticipate any demand for more, since any payload heavy enough to need more than 3 SRBs would be highly unlikely to fit in a 4m fairing anyway. Thank you for posting this, but one bit seems confusing. What is being shown in the center under the heading "Clam Shell CM Design allows easy hardware integration"? Are they saying that the pressure vessel splits at its widest point to allow access before each launch? Are you saying that they would install the couches and cargo carrying hardware before welding closed the pressure vessel? Are they saying that the pressure vessel splits at its widest point to allow access before each launch? With full atmospheric pressure* that joint is resisting nearlytwo million Newtons (101 kPa * 2.5^2 m^2 * Pi) or a half million pounds of force (14.7 PSI*(2.5 M*40 in/m)^2*Pi). That would indeed be convenient but looks hard to implement. *"Sea level is for sissies"
The joint would only have stress of 740lb per linear inch. This is worse. 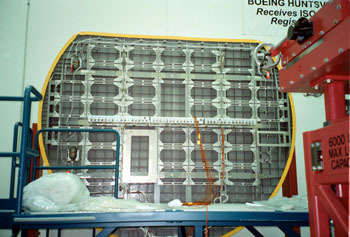 A flat bulkhead attached to a cylinder. At least, the CST-100 is cylinder to cylinder. 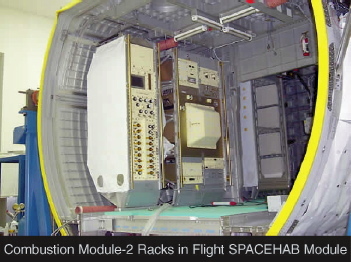 Maybe they do take it apart between missions like Spacehab. If the CST-100 requires an Atlas V 422, does that mean its too heavy for Falcon 9 ? It's not clear as to which LV configuration will be used - I trust a direct quote by Sowers to C. Bergin, but it could also mean that Boeing has modified the CST-100 CONOPS since 2011. I’m currently working with a team of talented Boeing and NASA engineers to develop the capability to transport astronauts to the ISS; designing the CST-100 capsule that will launch on top of ULA’s Atlas 422 rocket. Terse answer as usual. Maybe too terse for me this time. The acceleration problem you mention must be during SRB firing. AFAIK 400-series and 500-series carries the same liquid propellant load in both stages. The total acceleration difference between a 541 (or 551) and a hypothetical 441 (or 451) must then be due to dry mass (and payload) difference. A quick search seem to indicate just something like 3t dry weight difference located in fairing and interstage. The resulting acceleration difference seems much too little to account for the need to limit to 2 less SRBs, if this was just about limiting the acceleration load on the payload. The only reasonable interpretation I can think of is that it is the difference in loads the acceleration put on the centaur that is the limitation. There the acceleration combines unfavorably with increased payload and the fact that the weight of the 4m fairing is carried through the centaur as opposed to being directed around it to the interstage. My guess is the Centaur in the 400 series have a limit to the stress of lifting the entire payload stack along with aerodynamic forces. Where in the 500 series the payload fairing partially carry some the stress and takes the full aerodynamic forces. Yes, I thought of the aerodynamic and acoustic loads as a significant contributor after I wrote the previous post, but I did not post it since I thought it was enough to list the larger acceleration loads to get my point across. And yes, there are increased loads along the whole stack from more SRBs but the load difference between matching 4xx and 5xx Atlas Vs (with max payloads) on the core stages is relatively small. So, the centaur must me the limiting factor here. Not that there is anything wrong with with the centaur (except that it is overdue for some cost-optimization). It has excellent performance and reliability. It is standard practice to optimize harder for weight (including shaving margins a bit more) in upper stages than boosters, because that makes a greater difference in payload to orbit. (The current F9 US is a bad example of this--radical development&production cost optimization overrode performance optimization more than usual there (which is good for price/performance)--but the future reusable F9 US will have more need for near-optimal performance). edit: typos, included F9 counter-example. Looks like mechanical fasteners to me. Should be weld less unless they needed to add some welds that add weight. Wow. Thanks for the information. It looks like Boeing really would open up the entire "clam shell" between missions. I read "Hardware Installation" as being during construction, whereas between missions would be "Cargo Loading" (or "Payload Integration"). It's possible that they're including maintenance in that concept, but I'm not sold yet.